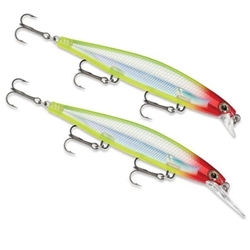 Rapala's Shadow Rap Jerkbait kicks almost 180 degrees right then left, so it can be fished in place with very little forward travel, keeping the flickering fade of the Shadow Rap right in a fish's strike zone. This jerkbait was made for all species of gamefish all season long. They are offered in two slow sinking running depths, 2'-4' or 4'-8'.